A lot of people call dduki Korean rice cakes, but that name always conjures up images of the Quaker oats man and flavorless pieces of cardboard. I think these dduk can be more likened to gnocchi, but instead of potatoes and flour, these dumplings are made of rice flour and water. One of the most popular dishes to feature these starchy bites is ddukbokgi which I tried for the first time at Mandu in Dupont Circle, DC. After some recipe browsing online, I realized that I’d never be able to recreate the dish authentically unless I had the Korean hot pepper paste, dochujang, and since I had never tried anything else with that same sauce, I thought I’d never have the opportunity. However, thanks to my mom and her grocery shopping impulses, the last time I was home during spring break, she brought home a HUGE tub of the stuff that only cost $7 without even really knowing what it was good for. When I saw it after coming back from Hong Kong, on my first trip to Kam Man supermarket, I made a beeline for the cylindrical dduk (you can use ovalettes in this recipe too but I prefer the meatier cylinders) and cooked the dish the same day. Paired with Korean-style bbq short ribs, this makes a really delicious and satisfying meal. Unlike the version at Mandu, I add red bell peppers, which accented the sweetness of the sauce and added the necessary crunch to contrast with the soft and squishy dduk. Yum. Just a note: if you’re heating leftovers the next day, it’s better to heat them on the stove rather than the microwave. That way they soften up again. Separate the dduk. If you think the cylinders are too big, you can cut each of them in half, but I like them to be quite substantial bites. Drop the dduk in a large pot of boiling water, making sure you salt the water first. Drain after cooked all the way through and soft; this usually takes about 5 minutes. In a bowl, mix together the soy sauce, dochujang, sugar, sesame oil, and garlic. It should taken on the consistency of ketchup. In a wok or large saute pan on medium heat, add oil. When hot, add vegetables and stirfry for 3-4 minutes until cooked. Add the drained dduk as well as the sauce mixture and stir until everything is evenly coated and heated through. Add salt to taste. For garnish, you can top the ddukbokgi with sliced scallions and toasted sesame seeds. I need to try this place in Dupont Circle! I am so intrigued! The dish looks so good! A Korean style gnocchi sounds really good! 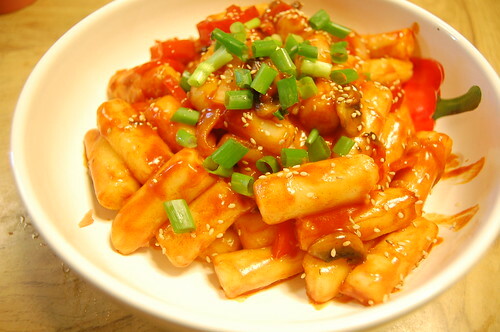 You are currently reading Ddukbokgi, Korean-style gnocchi at Notes on Food.